Only one month left for the 29th Hotel Equipment, the most extensive accommodation and hospitality exhibition in Turkey, and for the 25th Food Product, a trending exhibition of the food industry. The exhibitions where the giant companies of the sector will meet with visitors and procurement committees from 81 provinces domestically and from more than 20 target countries internationally have already achieved the %90 occupancy rate. 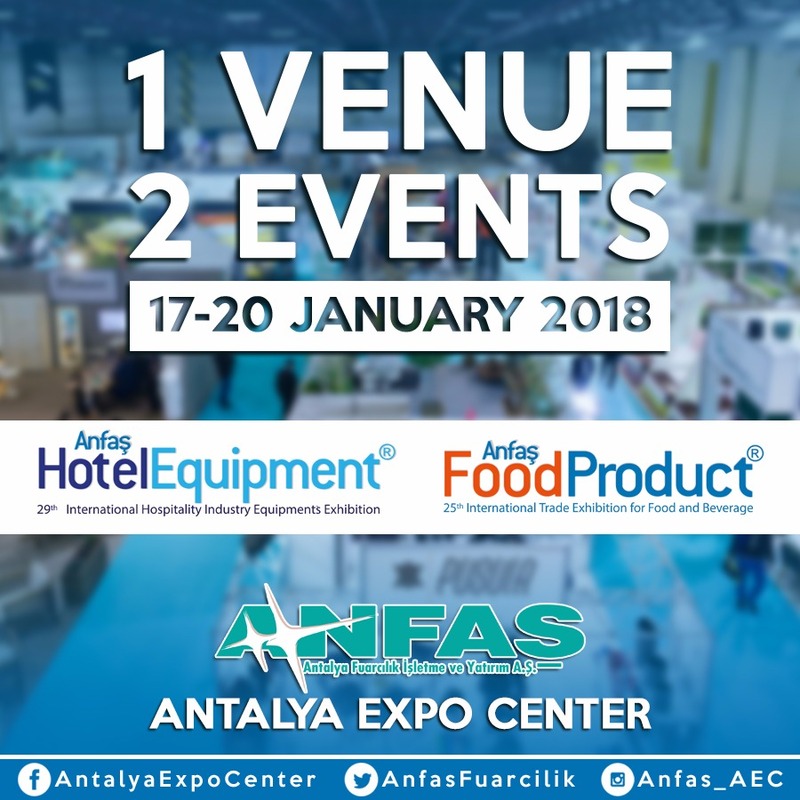 Thanks to Antalya Expo Center, the exhibitions that were held at different time frames due to insufficient space in the previous years will be carried out under the same roof which grew by %100 this year, from 20.000 square meters up to 60.000 square meters including 40.000 square meters indoor and 20.000 square meters outdoor area. The exhibitions that show similarity in participant and visitor profiles will open their doors simultaneously between January 17 and 20 2018 in accordance with the sector’s demand. The sector professionals who participate in the exhibition will be able to access simultaneously to all shareholders, dual meetings, events and conferences regarding the hospitality, hosting and food industry. With the coordination of BAİB - Western Mediterranean Exporters Union, BAKA – Western Mediterranean Development Agency, DEIK – Foreign Economic Relations Board, ATSO – Antalya Chamber of Commerce and Industry and foreign agencies ANFAŞ; professional visitors and procurement committees from Germany, Balkans (Albania, Bosnia and Herzegovina, Croatia, Montenegro, Kosovo, Macedonia, Serbia) United Arab Emirates, Brazil, Bulgaria, China, Palestine, India, Iran, Qatar, Northern Iraq, Kyrgyzstan, Kosovo, Kuwait, Latvia, Egypt, Uzbekistan, Saudi Arabia, Thailand, Tunisia, Oman and Yemen will attend. And also TÜROFED – Turkish Hoteliers Federation, AKTOB – Mediterranean Touristic Hoteliers Association, HOTED – Education and Decoration for Floor Services, POYD – Professional Hotel Managers Association, GIMAT – Ankara Food and Necessities Wholesaler Association, TAFED – Turkish Culinary Federation will be attending owing to agreements with TOBB – The Union of Chambers and Commodity Exchanges of Turkey and Antalya Commodity Exchange. The participants will have the opportunity to access to the most effective marketing means thanks to the event that will be organized under the exhibition. Industrial Symposium, “Consult to a master board”, and many other events will be held with the cooperation of TAFED - Turkish Culinary Federation under the 25th Food Product exhibition. The participant companies will introduce their current and new products to chiefs, through the Industrial Symposium and Consult to a master board that will be organized exclusively for Food Product. The excitement for the Hotel Design Show will continue in 2018 as well at the Hotel Equipment that will turn into a festival with its events. The Hotel Design Show to which the hotel investors, tourism managers, architects, interior architects, contractors and many sector professionals showed a great deal of interest will be held for the 3rd time this year. A 10.000 square-meter-special area will be built that will be comprised of 10 hotel rooms, welcome desk (reception) and a lobby at the Hotel Design Show which will be organized under the “retro” designing theme within the exhibition area. The 10 different hotel rooms, designed by 10 different interior architect members of the Chamber of Interior Architects of TMMOB will be completed in cooperation with the providers that will sponsor the activity and will open together with the Hotel Equipment exhibition. This event that will continue until the end of the exhibition will be the most visited part by the tourism investors and managers from both national and international market.